Trump pulled out of the Paris climate agreement, but over 60% of the commitments made in the Paris accord can still be met by local efforts to fight off climate disaster. California’s climate leadership is more important than ever, but right now it’s under threat from Big Oil. Our state legislators are voting this week on AB 398, a bad climate deal that will leave our most polluted communities behind. Tell legislators today to say NO to AB 398, which would undermine California’s climate leadership. Click here to send an email or call 916-694-1101 right now. 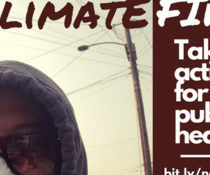 AB 398 includes a horrible give away to Big Oil that ties the hands of our local and state regulatory authorities, preventing the Air Resources Board from enacting critical regulations that cut greenhouse gases directly at the source. AB 398 undermines – instead of enables – our state’s ability to meet our climate goals. 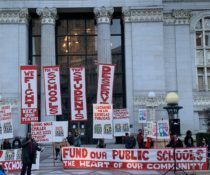 Will you join 350 Bay Area, Asian Pacific Environmental Network, Sunflower Alliance and other environmental justice groups to urge your legislator today to vote NO on this disastrous give away to Big Oil? 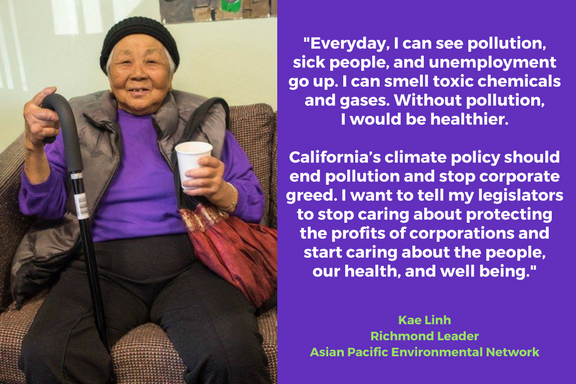 Take action now to fight along side Kae Linh and other climate leaders from California’s most polluted communities.